I am now a spoiled Christmas-season traveler. Why? Berlin, and more specifically, Christmas markets in Berlin. Everyone who has had the chance to experience Christmas markets in Europe — whether in Prague, Dresden, Salzburg or Brussels — knows just how special these festivities can be. Not only are they laden with stunning decorations, one-of-a-kind handmade crafts and unbelievable food, but the electric energy that radiates from the markets is guaranteed to get the whole family in the Christmas spirit. If you are looking to visit some of Europe’s best Christmas markets this holiday season and enjoy a well-rounded family getaway at the same time, Berlin is a great choice. You can get your dose of holiday cheer and work in some history, entertainment and culture in the bargain. With nearly 60 Christmas markets, Berlin offers plenty of options to immerse visitors in the spirit and feel of the holidays. Whether you are looking for something trendy, old-fashioned or fairytale-like, Berlin has them all. This Visit Berlin Christmas market guide is useful in steering you in the right direction. When visiting Berlin last Christmas, we stayed at the Scandic Berlin Potsdamer Platz, which is walking distance to one of the best markets for families: Potsdamer Platz’s Winter World. Big kids will enjoy tubing down Europe’s largest mobile toboggan run or trying their hand at a game of curling, while younger kids can delight in the swinging merry-go-round and tantalizing, colorful candy stalls. A large outdoor ice rink (with penguin skate aids to rent for younger skaters) is a hit for the whole family and offers free ice skating lessons for children ages 4 to 7. Want help planning an amazing Germany trip with kids? The decorations, wonderful food and stalls filled with handmade wooden crafts make Potsdamer Platz’s Winter World a real-deal Christmas market. There is so much going on at Winter World that you could visit on multiple days (as we did) and not tire of it. The market can be easily accessed via Berlin’s underground subway, the U-Bahn. TIP: The line for the toboggan run tends to be long in the evening, so visit Potsdamer Platz Winter World during the day for less of a wait. A classic, memorable and truly stunning Christmas market experience can be found at Berlin’s WeihnachtsZauber Gendarmenmarkt. Framed by Berlin’s magnificent concert house (Konzerthaus) and the French and German cathedrals, this market will stop you in your tracks upon your arrival —it is just that beautiful. You will find glassblowers, candlemakers, jewelers and even an origami master at the Gendarmenmarkt. Eggnog-covered pancakes for the win! Michelin-starred chefs offer their haute cuisine in heated tents while musicians showcase their talent on stage in front of the Konzerthaus, adding yet another element of festivity. The food is to die for: My children discovered eggnog-covered pancakes here and became forever spoiled, so be warned! The WeihnachtzZauber Gendarmenmarkt is also easy to reach via the U-Bahn. No matter the season, the Berlin Zoo is always worth visiting. One of the oldest, largest and most biodiverse zoological gardens in the world, the Berlin Zoo offers so many fantastic exhibits that a visit could last all day (especially when combined with the adjacent Berlin Aquarium, which I also recommend). Don’t have all day? Well, then, be sure not to miss the glass-domed hippo house, from which kids can watch residents above and below the water through large glass panels. The newly renovated nocturnal house allows visitors the rare opportunity to see animals that are active at night. And as it is nearly impossible to say no to penguins, guests can visit the penguin house to watch king penguins waddle around on ice and snow. With nearly 18,000 animals and wonderful, well-maintained exhibits, a visit to the Berlin Zoo will be memorable for the whole family. If you have the time and your kids have the energy, buy the joint pass to the Zoo and the Aquarium. Spanning three stories, the aquarium is home to tropical and indigenous fish, jellyfish, crocodiles and insects. The Zoo and Aquarium are located in Berlin’s famous urban park, the Tiergarten, and can be easily accessed via the U-Bahn or S-Bahn. On a day when the weather is good, spend some time in the Tiergarten itself, a great place to let the kids expend energy and appreciate the beauty of Berlin’s central green space. Take a stroll, have a picnic — or perhaps a cup of hot chocolate for the kids and gluhwein for the parents — and explore the beautiful gardens. The southeastern corner of the park offers a large playground, and in winter, it is possible to skate on the small lakes inside the park. Taking time out to enjoy the Tiergarten can be a nice break from the busy Christmas markets. We hadn’t planned to visit the Deutsches Technikmuseum (German Museum of Technology). But when we passed by it and saw a huge “Candy Bomber,” one of the aircraft used by Western Allies to bring supplies to Berlin during the blockade in 1949, we knew that this was a place to take kids! And boy, we were right. This museum is awash with large collections of locomotives, planes, boats, engines, looms, tools and much more — all having to do with Germany’s history. Kids can knot ropes, print paper, shred grain, or operate radios and telephones. The aerospace and maritime exhibitions were highlights for our family. You can easily spend half a day in the Technikmuseum — there’s an indoor restaurant when kids and adults need to refuel. Reaching the museum by U-Bahn is simple. No trip to Berlin would be complete without paying respect to the city’s historical past. Take the time to see remaining pieces of the Berlin Wall, visit Checkpoint Charlie and marvel at the Brandenburg Gate and the Reichstag building (home to the German Parliament, or Bundestag). 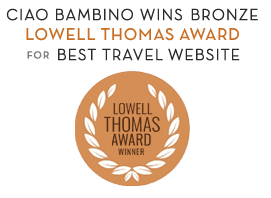 Ciao Bambino contributor Anna Tobin wrote this piece on the best ways to educate and expose children to the complicated history of this city. Berlin is a fantastic place to visit any time of year, but the addition of the Christmas markets, which generally run from late November through the New Year, makes it extra-special. Take the time to plan a Christmas holiday for your family in Berlin — it will be one that they won’t forget! Editor’s Note: Photos by Loren Braunohler.